McLaren reveal their brand new MCL34 car ahead of the 2019 F1 season. 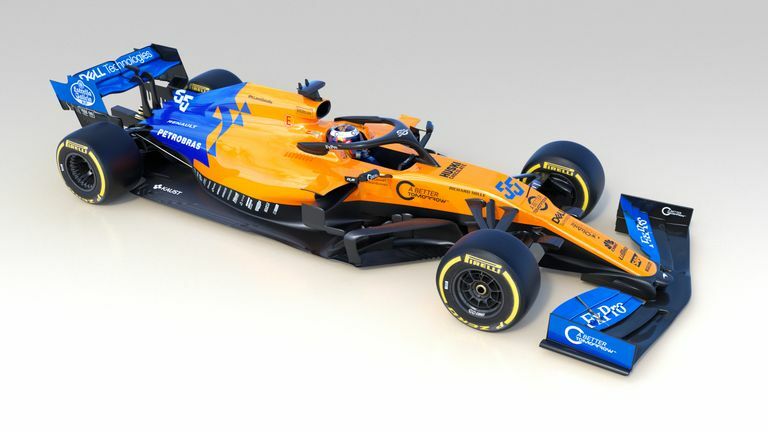 McLaren have unveiled their new MCL34 car for the 2019 Formula 1 season. The car retains the historic papaya colour of last year, with added blue at the front and rear, with the team saying their second Renault-engined car features "substantial changes" from its disappointing predecessor. "We just want to see a good step forward from where we were last year," chief executive Zak Brown told Sky Sports News. "We didn't develop a very good race car, we've certainly got higher hopes for this year's car. But it's hard to tell until you get out there. The competition is only getting tougher in this sport." Although they finished sixth in last year's Constructors' Championship, an improvement of three places over their final year with Honda, McLaren admitted their car's performance fell a long way short of expectations with the second half of the season proving especially difficult. But the team and, who have undergone structural and personnel changes in the last 12 months, believe they have understood the reasons for their 2018 struggle and will avoid making the same mistakes in the future. "We're all committed, motivated and united in our ambition to return McLaren to competitiveness, and the MCL34 is only the start of this process," said Brown. "We have a fresh driver pairing, who together represent the new generation of Formula 1 talent, and are an integral part of the team and our collective effort to advance McLaren forward." Sainz, still only 24, starts his fifth season of F1, while Norris becomes the latest graduate of McLaren's young driver programme after a stellar junior career and runner-up finish in F2 in 2018. "I've got a lot to live up to, the history of McLaren, there is a lot on my shoulders," said Norris at his first F1 car reveal. "I'll try to make a positive effect, and know that I'll have a longer career in F1 being at the age I am." After stints at Toro Rosso and Renault, Sainz effectively replaces countryman Fernando Alonso as the team's experienced driver and says he feel more prepared for an F1 season than ever. "I've been especially focused on my preparations this winter," he revealed. "New training routines, new diet, very specific simulator sessions, and extra time with the engineers to develop and align certain aspects of the car to my preferences. The factory has become my second home since I moved back to the UK and everyone in the team is moving in the same direction." However, Sainz said it would be "a big mistake to set our goals at this part of the year" before the new MCL34 has even run on track. What else is new at McLaren? McLaren's management and leadership structure have undergone numerous changes over the past 12 months. Under the leadership of Brown, former racing driver Gil de Ferran begins his first full season as sporting director, while Pat Fry has returned as engineering director. Andreas Seidl, the former Porsche sportscar boss, is joining in the role of managing director in May while the highly-respected James Key is scheduled join the team at some point in 2019 as technical director. "We're in a rebuilding process and it's going to be a journey," added Brown.